Univ. Prof. Dr. Dr. h.c. Felix Unger, born 1946, is one of the world’s leading cardiac specialists, and graduated at the University of Vienna, Faculty of Medicine in 1971. He implanted the first artificial heart in Europe in 1986, and has received numerous awards and citations for his work. The pioneering surgeon is co-founder of the European Academy of Sciences and Arts, an organization that now counts over 1,800 members, and he has headed the Academy as its President since 1990. 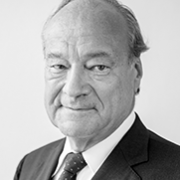 After graduating at the University of Vienna, Prof. Unger has been appointed 1978 as Assistant Professor and 1983 as full Professor for Surgery. He then directed one of Austria’s largest centers for heart surgery for over 25 years (1985 – 2011). His main interest in research has been the artificial heart. Next to his role as President of the European Academy of Sciences and Arts, he is also presiding the Alma Mater Europaea. In the course of his long career, he has published over 400 papers and 17 books on cardiac medicine and is member of the most important Scientific Associations in his field as well as in many Academies of Sciences.